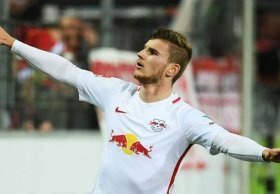 Liverpool are reportedly prepared to offer strong competition to Bayern Munich in the race to sign Timo Werner from RB Leipzig when the season comes to a close. The Germany international has remained committed to the Bundesliga side over the past two-and-a-half seasons but he has recently hinted that he could pursue a fresh challenge away with Bayern a potential destination. However, German outlet Abendzeitung claims that Reds are also in contention to sign Werner after having sent their scouts to watch the forward in close quarters on different occasions. Werner has already scored 10 goals from 16 Bundesliga appearances for Leipzig this term adding to the combined 34 contributed from the previous two campaigns. His current deal is scheduled to expire at the end of next season and so far, he has given no indication that he would like to extend his stay beyond the existing length of the contract.